Because I like to experiment I’d like to offer my book, Mytro, for sale in Bitcoin for $2 off the Amazon price. It’s a test and I’m not sure many will take me up on my offer, but let’s give it a try. Click below to enter your shipping information and to check out. Lay Your Cards Out by POLIÇA is one of my favorite songs and I listened to it a lot while writing Mytro. I even named a chapter, near the end, after the song. Why Did Agata And Turtle Appear Under The Charles Bridge? First seen in Chapter 27 of Mytro, the Charles Bridge is an iconic location briefly mentioned by Agata to Turtle as being close to Brehova — the next stop for the pair after Barcelona. When a reader comes to the realization that Turtle and Agata used the Mytro to travel from Barcelona to Prague in no time flat, Agata’s phone immediately began serving roaming messages; the Charles Bridge literally serves as a bridge to stabilize the reader in the first few pages of the chapter. Through some communication and the use of maps on a phone, the characters find themselves reaching one of their goals in the Brehova district. The First Copies Of Mytro Are On Their Way To The Post Office! Thank you early backers and I hope you enjoy your books! Win A Paperback Copy Of Mytro! Giveaway ends May 31, 2014. 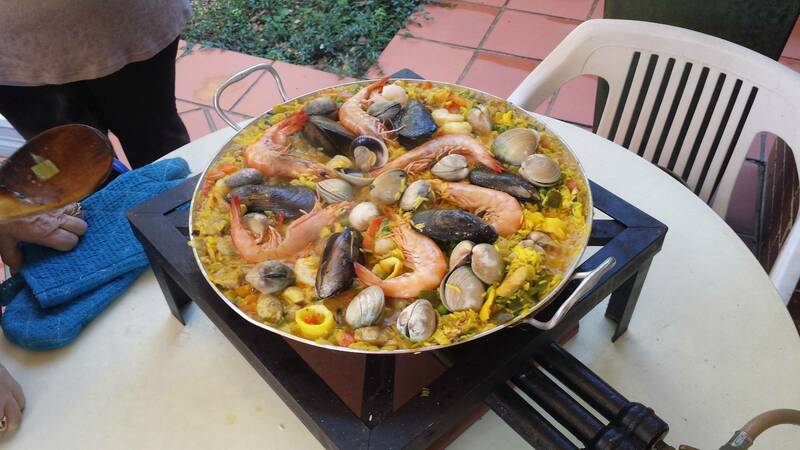 Paella is a Spanish dish that is made of sausage, shrimp, and deliciously-cooked rice. If you go to Barcelona they make it in a special wok-like pan that makes special crispy rice on the bottom that the Spanish call socarrat. It is one of my favorite dishes – up until I became a vegetarian – and I wanted Agata and Turtle to eat some while they were visiting Spain. A lot of people have been asking me where I got the idea for Mytro. I remember it vividly: we were in Madrid and I was under a statue of Lucifer falling from heaven when inspiration struck like a bolt from above.